Sound the klaxon, for I have decided to throw something away every single day for the whole of 2018! Having left my job as Editor in Chief of ELLE Decoration at the end of 2017, and then losing my beloved father a week later, I recognise this as a continuation of a desire, nay need, to make space, physically, emotionally, and literally, for a fresh start with a new healthier freedom of living and working. But it’s also increasingly clear to me that to maintain a sense of wellbeing and calm in today’s world we need to take decisive steps to cut out the overwhelm, whether from our phones, emails, news, noise or other people. And it needs to be happening inside our homes too. In short, I want to be able to sit in any room in my house, and to be able to look in every direction, and not see, or be distracted by, anything that has no significance for me. Have nothing in your bedroom that you don’t love… literally! You see while I’ve always been fervently anti-clutter, I am by no means a minimalist. I don’t want an empty home, and I personally feel that such a reductive stance is a reflection of an inner emotional state in its own right, and not one that’s appropriate to me. However, there are many aspects of the minimalist viewpoint that make a great deal of sense: for example, when you discard something, you gain more than you lose (just finished reading Fumio Sasaki’s ‘Goodbye, things’). 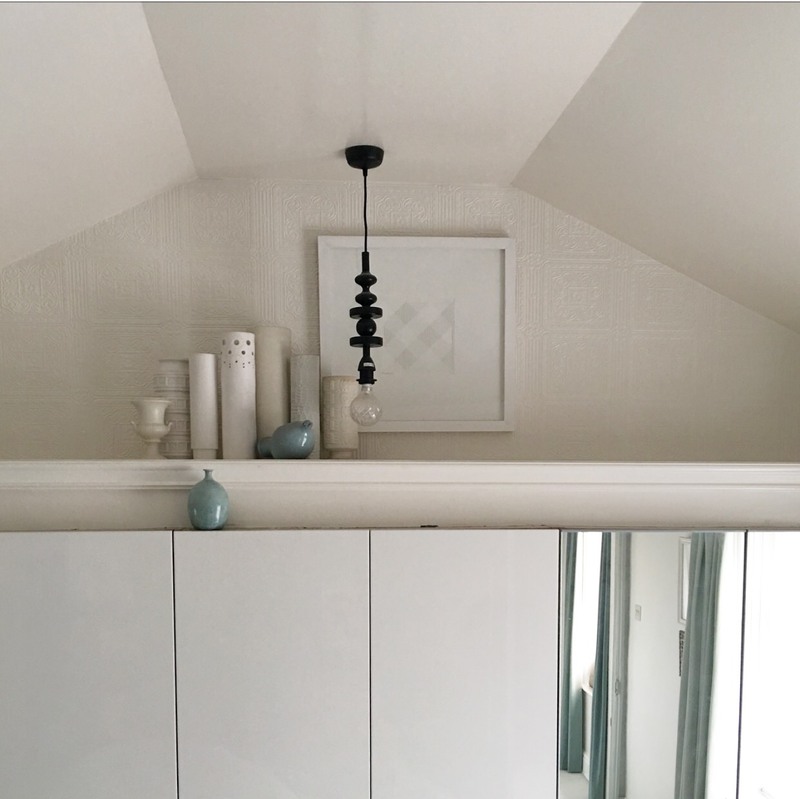 However, I like to surround myself with things: art, family photographs and objects that give me pleasure, prompt happy memories or have personal emotional resonance. What Marie Kondo might call “things that spark joy” or remember William Morris’s famous edict to “have nothing in your home that you do not either believe to be beautiful, or know to be useful”. I heartily subscribe to both points of view. In addition, I love my ‘things’ to be set against a backdrop that is rich with warmth, texture and detail. Yet this background, the envelope of my home, has also been very carefully designed to minimise distractions, colours that clash, or alignments that jar (I literally can not sit in a room if pictures are wonky! Even at school I’d been know to get up to surreptitiously clean the last corner of the blackboard if the teacher had missed a bit. Obsessive, moi?). You see I don’t want bland, I want coherence. Ultimately I guess the quest is for that heady space in between soothing and stimulating. A home that reflects my loves, and is also a place of solace. The point is, the two should be one and the same. My general rule has always been, if you were moving house today, would you pay someone to box and carry x, y or z? If not, out it goes. However, making it a daily action focuses the aim. As such, I wasn’t sure what sort of goal to set myself at first. One thing a week didn’t seem like enough, however one a day seemed significant enough to make a difference. And so far, I’ve easily exceeded this. However I suspect it may get a lot harder as the months progress — more considered clearing vs easily relinquished excess. But there’s another level too, as I write this, having already started with great gusto, it occurred to me that I could also get rid of the microwave. I bought it when my son was born, primarily for sterilising bottles, and since then I’ve only ever used it to heat milk for hot chocolate. It’s compact, clean, white and it’s been inoffensively sat on my kitchen worktop for the last four years. But this very morning I realised I simply don’t need it. I never use it for cooking as frankly I’m suspicious of the idea of super-zapping as a means to heat food, and I already possess a small milk pan and a fast-acting indiction hob, so… out it goes. Snapped some pictures of it in-situ, and it’s already posted on eBay. And I’m listing out my ‘relinquishments’ to document the process for myself, more than as a list for reading (could become a tad dull!). And I shall update month by month to share the lessons I’m learning, and how I’m getting on. So here’s my first quarterly report! I always do a big New Year clean’n’clear in January, and had already started this before I formalised my intent to carry on all year, so I’m a bit vague about what I got rid of; definitely my old TV (I upgraded to a very ‘minimal’ new Samsung Frame just before Christmas), 3 x old electric heaters, 1 x printer, 1 x scanner, all previously languishing in my basement, just in case of what…? ), and I definitely achieved the month’s goal of an item a day… if not more, but I’m not letting myself carry anything over. This month’s choice of charity was the YMCA, primarily because they collect, and they take old electricals. Major clothes clear out too, bagged up at least 20 items to go to charity. Sorted through a box of old cassette tapes and videos, ditched at least half of them. Suspect the rest of the box will go later in the year, after all I have neither tape recorder or video player? Baby steps, baby steps! Conclusion: Good start. However easy to clear old clothes and clearly redundant stuff. Feeling like I can do this, albeit in ‘refining’. i also seem to have bought a fair few things. Things bought: 1 x jute ottoman from Soho Home (£125), some grey knitted slippers, £38 (I threw away my old ones!) and a matching eye mask (£12). Framed one of my son’s pictures, which I’d been meaning to do for about a year. Also ordered some family photos via Apple, and bought nice silver frames from The White Company to do them justice. Oh, and 3 x pairs white washing up gloves from Lakeland (£3.69 a pair) so I felt better about all the cleaning (see my month of extreme cleaning post!). I do not appear to have given up corresponding matching items… but giving self a break as such a lot went to the YMCA. 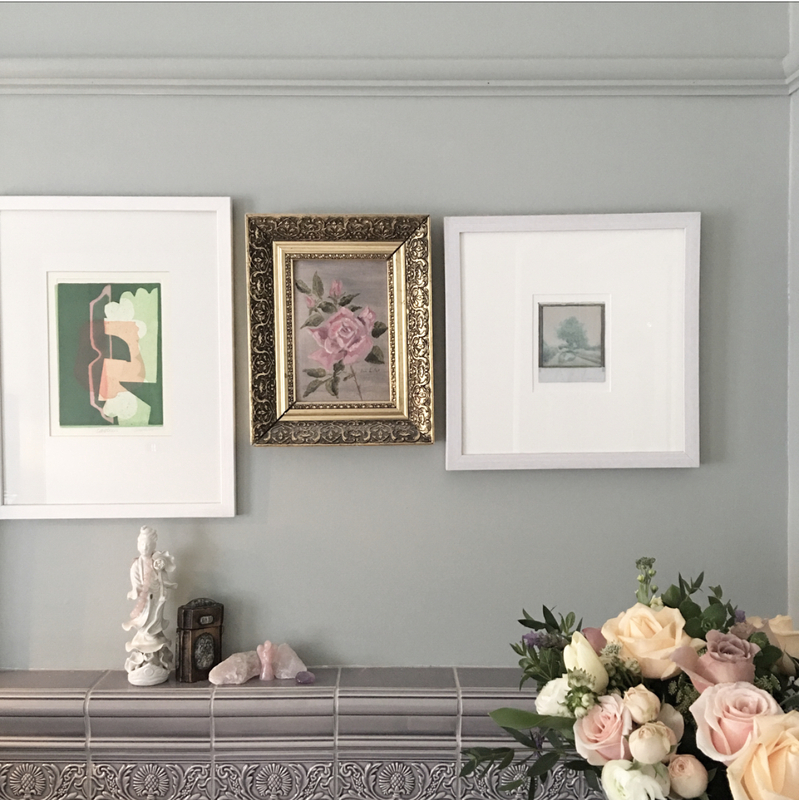 Note on picture frames: If you’ve gone to the bother of actually getting a print done, or buying a picture, then herewith my eternal mantra ‘buy right, buy once, buy the best you can afford’ in terms of frames. I’d batch bought some cheapo frames from TK Maxx, but in the light of my reassessment of all things, they looked a bit rough, or the mounts were not crisp enough, so inevitably my now hyper precious photos of my father and son together, needed better to honour them. Buying cheap = money down the drain. I really should have known better. However, I remember being caught up in the enthusiasm of getting a family photo wall done, rather than perfect. Which is also sometimes ok.
4 x Knoll white Bertoia chairs relocated from my former office, too uncomfortable to sit on at home. 1 x Camerich dining table bought as a stop gap until could afford new marble top for the beloved Saarinen. Purchased just before Christmas as a gift to myself, and no-one needs two dining tables. 1 x old pair Gucci aviator sunglasses. I bought a new pair last year which I love. I don’t need two pairs. 3 x brand-new silk scarves which I have kept forever, but will never wear as just not my thing. They sell for way more than expected. Am quids in. 1 x cashmere travel blanket, un-used, also sells for over the odds. 1 x 3-metre long faux pearl necklace that’s been languishing so long in my closet, I’d forgotten I had it. 1 x YSL black patent ‘Tribute’ handbag, loved but not used for at least five years. 1 x crystal vase plus a matching pair of candlesticks, all of which had been in my guest room, newly recognised as unfortunate repository of things I don’t like that much. Time to let them go. 9 x items to charity shop… including pair trousers that are too small, 2 x jumpers not worn in God knows how long, and assorted other highstreet items including a long navy trench coat from Mango and some sparkly black court shoes from Miu Miu, both ‘trends’ I’m dismayed to read in the subsequent Sunday supplements that are hotly tipped for a ‘return’. However I have another trench which I prefer, and one of the ‘jewels’ had fallen off the courts so I was never going to wear them again. Then… 3 x mugs that are not quite white, so ditching, as they sit unused at the back of the shelf, because all the rest of my crockery is white, which is what I prefer. 1 x ‘pot’ that’s not a nice colour (the wrong sort of turquoise), kept only because it was a gift. And a cushion with feathers on it, which I’ve no idea where it came from, but I have a bit of a thing against feathers, so it had been ‘popped’ onto small’s bed instead. 3 x tins of paint that had gone off. Do these count? 5 x tubes/pots of rarely used make-up held onto for well over a year, and eye-shadows I never ever wear. Conclusion: Lot of big things gone, but total items less than I thought, and I’d forgotten what an almighty faff eBay can be. Then again, it all sold for just under £2,000, so who knows, I might even turn a profit on the selling vs expenditure! Definitely on a roll, although I’m painfully aware that I’m choosing things to let go in a quite ad hoc way, rather than approaching this more systematically. Things bought: 1 x small blue vase by a Maurice Young of Chichester, purchased for £40 from Worthing Museum. Added as a ‘friend’ to an existing blue ceramic bird (much-loved and bought years ago from a Parisian flea market) that sits in a collection above my wardrobes (see below). This is what I see when I wake up , and it makes me very happy, although see caption! The new pot in situ. Love it! Albeit of course now eyeing up all the other ‘pots’ in the background and wondering if I love some more than others. Also recognised that I only truly like cylindrical vases, not sloped ones, so that led to another vase being let go elsewhere. 58 x books sold via WeBuyBooks.co.uk for £101.56 It’s an app that converts your phone into a book barcode scanner and then you get an instant quote. Just scan, total, box and get paid! Best of all, they collect, so you don’t even have to lug the boxes to a drop-off point. 4 x assorted cushion fillers that have been waiting for well over two years for me to make covers for them. Not going to happen. 10 x plates bought from IKEA (4 x side, 6 x dinner). Because, although they are a very seductive biscuit colour, I have always preferred white porcelain, and I think 10 x existing plates in each size is quite enough. My dining table won’t accommodate more than five, so…? 1 x microwave used only to heat milk. I have a pan. 1 x pair pink wellies, don’t ask. Plus at least another 20 relatively random items from a bottle opener (I had three) to plain HB pencils (I had about 30 so dumped all the stubby ones!). Conclusion: Have adopted more of a methodical approach, ie I went through all of my books in one go and decided which to keep vs which to lose based on whether I’d consider re-reading them. Also recognised I had about 20 novels I either haven’t read, or couldn’t remember reading. These are now grouped together and easily accessible, and I’m going to try to read all of these before buying any new. As I keep all my books in the basement, I briefly considered bringing these up to the living room so I wouldn’t forget, but I have another ‘thing’ against books being on show, which should probably be a whole other post! Interestingly, also noted I have quite a collection of brand-new, still-in-their-cellophane-wrap, Folio Edition hardback classics, bought with the vague intention of building a library for small. In my current mindset, this strikes me as rather misplaced. Not ready to part with them yet though, so in a ‘to-think-about’ pile. Next month I will go through my clothes with the same mentality ie what do I wear regularly vs keeping for some ‘occasion’ and especially thinking about multiples… how many plain black or white t-shirts do I really require? Things bought: 1 x adjustable standing desk (£138) so I can now stand and write, rather than sit and ponder. Used to have one in my office in EDHQ, and while it takes a bit of getting used to, I found it absolutely heightened my productivity. I can be the queen of displacement activity, and I have a book to write, so no more excuses! “It is not possible to hold the day; it is possible to lose it. I’m struggling with this too. I have a burning urge for fewe more significant things in the house. No more Zara Home knick-knacks. I have never sold on eBay because I can’t face the hassle, so the local charity shops are doing well!! Oh, I know what you mean. Anything I don’t have a readily available box for, goes straight to charity rather than eBay… you get what you giveth, as they say, it’s all good karma. This was so great to read as I too have been going through this process. My aim this year was to refuse (throw away), regift (charity) or reinvent (adapt/change) things in the house. This includes getting clothes changed, large charity shop hauls, which leave me with a good feel factor and numerous trips to the tip. It is so cathartic like a spring clean for the home and soul.